Richard Hernandez obituary. Carnes Funeral Home. 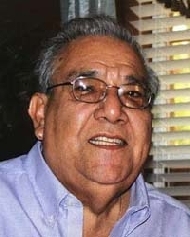 Richard Hernandez, Sr. went to be with the Lord on Monday August 15, 2016 in Galveston, TX. Mr. Hernandez is a lifetime resident of Galveston, County, TX. He and his family made their home in Texas City, TX where he worked as a Lab Technician in the Petro-Chemical Industry retiring after over 40 years of service. He will be remembered for his love o of Family and Friends. He is survived by his wife, Myrna Welch Hernandez; children, Fred Hernandez, Chris (Alyssa) Hernandez, Debbie Hernandez, Vicki Lynn (Alan) Holland; 8 grandchildren, 7 great- grandchildren and a host of other relatives and friends. He was preceded in death by his Parents, Ramon and Natividad Briceno Hernandez; 7 siblings and two children, Laura Diana Hernandez and Ronda George. The family will receive Visitors for a Public Viewing, Friday August 19, 2016 beginning at 4:00 PM until 7:00 PM. The Rosary will be recited at 6:00PM. This Service will be held at Carnes Funeral Home 3100 Gulf Freeway, Texas City, TX 77591. There will be a Funeral Mass Saturday, August 20, 2016 at 10:00 AM at St Mary of the Miraculous Medal Catholic Church 1604 9th Avenue North Texas City, TX 77591. The family will have a private burial. Memorials may be sent to the Funeral Home.